Deanna Durbin was the best Christmas present Universal Studios ever received. The 15-year-old singing sensation made her feature debut in 1936’s THREE SMART GIRLS, released five days before Christmas. The smash hit helped save cash-strapped Universal from bankruptcy, and Miss Durbin signed a long-term contract, appearing in a string of musical successes: ONE HUNDRED MEN AND A GIRL, THAT CERTAIN AGE, SPRING PARADE, NICE GIRL?, IT STARTED WITH EVE. 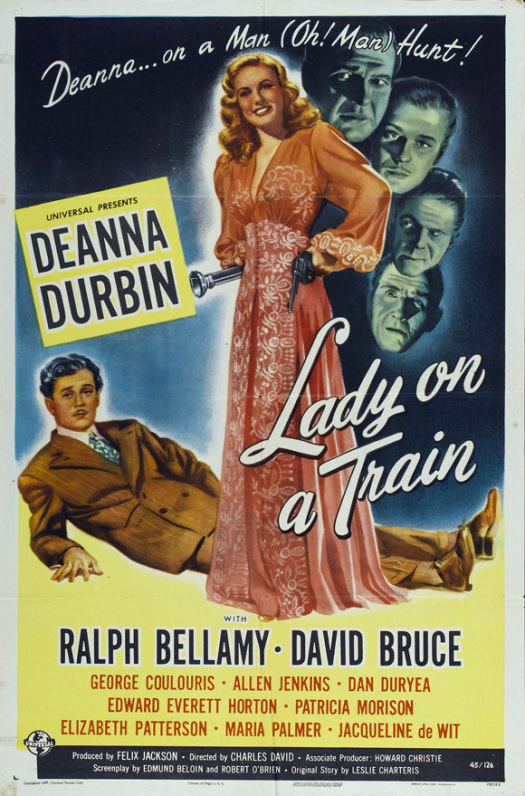 One of her best is the Christmas themed comedy/murder mystery LADY ON A TRAIN, one of only two films directed by Charles David, who married the star in 1950, the couple then retiring to his native France. This entry was posted in Film, Film Review and tagged Allen Jenkins, Charles David, christmas, Christmas Movie, Cracked Rear Viewer, dan duryea, David Bruce, Deanna Durbin, Edward Everett Horton, Gary Loggins, George Coulouris, Lady on a Train, Leslie Charteris, Patricia Morison, Ralph Bellamy, Through the Shattered Lens. Bookmark the permalink.